This blog is brought to you courtesy of Bikie Girl Bloomers. At the beginning of each year, our minister encourages all of our church's members to participate in a one month fast plus a recording of our dreams and visions for the year to start it off right. Dreams and Visions? That’s pretty weighty and airy fairy stuff for a left-brained introvert like myself (I surprised you didn't I, I've learned to make networking and public speaking look easy with a lot of hard work.) It makes New Year’s resolutions like finally going to the gym seem lightweight in comparison. Further, our minister asks us to categorize our Dreams and Visions into personal, marriage/family, faith and the outrageous. I have a lot of resistance to writing down resolutions much less Dreams and Visions. There is something scary about committing such weighty topics to paper. And of course, once they're written down I feel the push to take action. Which is the point. Each year, I say I’m going to do this exercise but never seem to get around to it. Then another year flies by and I end the year with an empty feeling asking myself: what was this year about? Why was I here? What did I want to achieve? How can I know the answers to these questions if I was unwilling to make a commitment to myself? I have no problem with fasting: which usually is simply giving up an unhealthy habit or some food that I shouldn’t be eating anyway. I've had more success putting together Vision Boards. They can actually can be fun to do, and I've even had some pretty startling success with them. Over four years ago I had created a Vision Board that was propped up at the back of my desk and then slipped behind it. I didn't even notice. One day while doing a deep cleaning I found it back there, and guess what? Two of my big dream visions had come true! I had wanted to decrease the number of medications I needed to take to control my autoimmune disease: I started that year taking 4 and at the end the year I needed only 1. I also wanted to move my passion of bicycling into a viable business. By the end of that year I had earned my League of American Bicyclists safety instructor certification and had taught several bicycle safety classes. My business was up and running. This year, I've finally decided that I don’t have to be afraid of having Dreams and Visions nor of committing them to paper. And taking action on them. The funny thing is that I have already taken action on my unwritten Dreams and Visions. I know that another year will slip by if I don’t hold myself accountable. But I also know I can talk myself into or out of just about anything. So now I have an accountability partner who I meet with every other week. We meet tomorrow to share our Dreams and Visions and guess what? Of course I haven’t written them down yet. I refuse to show up for coffee tomorrow with a blank piece of paper. I'll get to work and write my Dreams and Visions in ink before our meeting. Since I'm a visual person I started first with my Vision Board that will hang in my office (not sit on my desk and fall behind it). Here's my latest board. Become a League of American Bicyclists Master Bicycling coach. There are only three women in the U.S. that actively hold this title. We're asking the League to let Pedal Love host an "all- women" master’s class here in California later this year. What are your Dreams and Visions for his year? Join me in committing them to paper and taking action. I look forward to sharing my Vision Board with you next. Send me a note and your Dreams and Visions might just appear in my next post. Kellie did her first multi-day, fund-raising bike ride in 2002 after a co-worker dared her to take up the challenge - the seven-day ride from San Francisco to Los Angeles. In 2010 Kellie was diagnosed with an autoimmune disease: Mixed Connective Tissue disease that left her so weak she could barely dress herself. Through medication, dietary changes and exercise she was able to recover much of her strength. Kellie does most of her local trips on her trike including shopping, running errands, attending fitness classes, visiting friends and even riding to church. In May 2013 Kellie became a certified bicycling instructor via The League of American Bicyclists. She now teaches both group and private bike riding classes. Contact her for class information. Learn more at: https://www.facebook.com/Bikeucation/. Kellie riding for the first time at the Velo Center in Carson. My body was in perfect equilibrium balanced between fear and excitement. At last I was going to ride the Velo Center velodrome. Not only was I riding, I had the opportunity to get track certification so I could ride on this monster during open sessions. The notice was posted on the Major Motion recreational Cycling Facebook page: track certification classes available. I jumped at the opportunity without a second thought as I usually do. I can be very compulsive which often leads to me pulling my foot out of mouth. You think I would have developed some control after 61 years, but my excitement overcomes what little self-control I have. But wait a minute! We are a group of ten and there is only one other women. And these folks are much younger than me: most in their 40’s. My stomach started doing back flips! Would I be able, physically, to hang with these cyclists? Track fact: The Velo Sports Center is the first and only permanent indoor track of international standard in North America. So now I’m at the Velo Center being fitted for a track bike. A track bike is a different kind of bike that also had me nervous: it has one gear, no brakes and no flywheel so you HAVE to keep pedaling: you cannot coast. The original fixie.You stop the bike gradually by exerting backward pressure on the pedals. Settle down stomach! Our coach taught us how to start and stop with a track bike and sent us onto the apron of the track to practice. So far I’m good. She identified the different lanes on the track and assured us that we will be successful in learning these new skills. Even a granny! She took us around the track; follow the leader style, so we could get a feel for how fast we had to ride to stay on the track. I had to find my balance to stay upright. If you ride too slowly you'll slide off the banked track. Track fact: Maximum inclination: 45 degrees. I love the feel of the track as the wood gives, rebounds and creaks under my wheels. It feels alive. Track fact: Approximately 33 miles of Siberian Pine were used to create the cycling track. The more I ride the track, the more comfortable I’m feeling. My nerves begin to subside. The more skills I learn the more I'm balance between fear and excitement. Excitement wins! Then another emotion takes hold: joy. This is fun! The fun I experienced when Dad took off my training wheels and I balanced on a two-wheel bike. The fun I had as a kid riding to exotic places, like the pet store or the movies on my bike. Track fact: 250-meter international size track. I’ve completed three training sessions and will need a few more to get my certification. Riding the track is a wonderful way to get a workout: the “weather” is always the same since it's an indoor, climate controlled facility. I was able to get into a balanced groove while completing my training exercises since the normal distractions you encounter on the road are missing (cars, stop signs, traffic signals, etc.). And the best part? I have a valid excuse for buying another bike! Now it’s your turn. Velo Center: http://www.stubhubcenter.com/velo Address: 18400 Avalon Blvd, Carson, CA 90746 Phone:(310) 630-2064. Kellie Morris did her first multi-day, fund-raising bike ride in 2002 after a co-worker dared her to take up the challenge - the seven-day ride from San Francisco to Los Angeles. In 2010 Kellie was diagnosed with an autoimmune disease: Mixed Connective Tissue disease that left her so weak she could barely dress herself. Through medication, dietary changes and exercise she was able to recover much of her strength. Kellie does most of her local trips on her trike including shopping, running errands, attending fitness classes, visiting friends and even riding to church. In May 2013 Kellie became a certified bicycling instructor via The League of American Bicyclists LCI program. She now teaches throughout Long Beach and Los Angeles, writes the "We All Ride Bikes" column and hosts podcast for PedalLove.org. 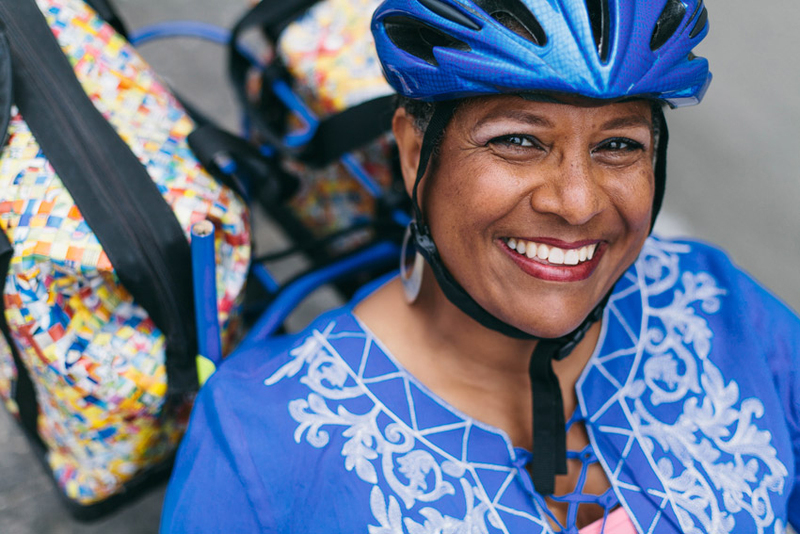 She is a co-founder of the brand new Carson Bicycle Coalition. Image by Lisa Beth Anderson. Find out about Kellie's private and group classes by contacting her at kellie_morris(at)hotmail.com.